The Branch Line Society, in conjunction with The Locomotive & Carriage Institute and First Great Western, ran another tour, "The Great Western Tracker II", on Saturday 12th October 2013, with all proceeds going to the Railway Children charity. Once again I was privileged to be asked to take photos of the tour and had another great day out! The tour started from Bristol Temple Meads running as 2Z10 to Exeter St. David's, then as 2Z11 to Plymouth, 2Z12 to Goodrington Carriage Holding Sidings and finally as 2Z13 from Goodrington CHS to Bristol Temple Meads via some very interesting routes! Thanks to all at BLS for asking me along and also to FGW staff for their help during the day, especially Don Church, FGW Competence Manager, who took the photos on my behalf from ground locations at non-station stops. After reversing at Lipson Siding 3, 150 927 returned to Laira Junction with the Great Western Tracker II tour where it reversed again, this time to pass through Laira Depot on Through Siding 2 to Mount Gould Junction. 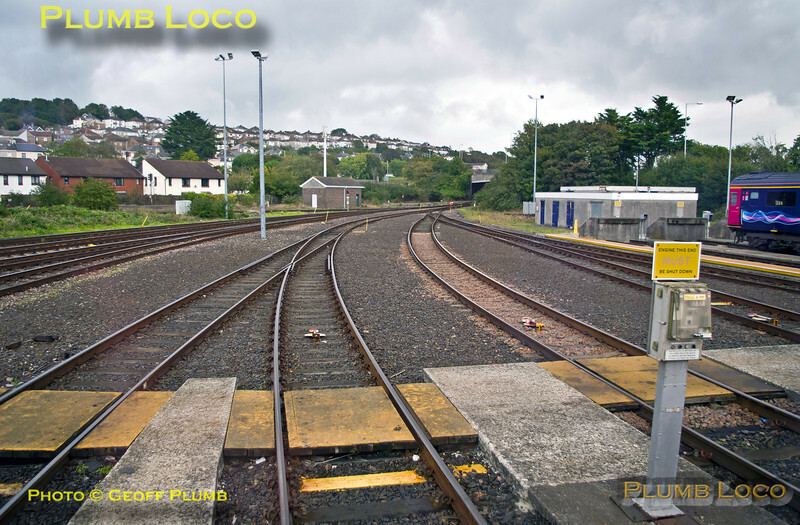 Through Sidings 3, 4 & 5 are to the right and the Embankment Sidings beyond on the far right. To the left is Through Siding 1 and beyond are the through sidings into the HST Shed and dead end roads. 13:22, Saturday 12th October 2013. Digital Image No. IGMP1564.